Clark Stationery - Boatman Geller - Samsung Galaxy S4 Go to Ivy + Anchor for all designs and monogram/color options. Item Name: Samsung Galaxy S4 Go to Ivy + Anchor for all designs and monogram/color options. Description: Personalize your cell phone with these stylish, customized cell phone covers. This design allows you to choose a single initial, monogram or name in font of your choice. Great gift for anyone with a cell phone! These phones cases take 2-3 weeks, please allow time! 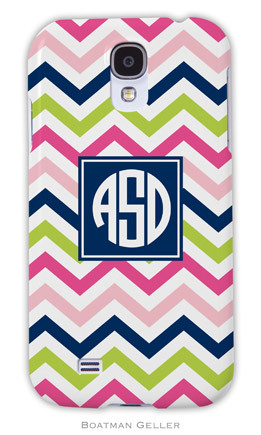 This case comes in all Boatman Geller designs, fonts, monograms and color combinations. In a sleek and tough (with rubber insert). Also available in Samsung Galaxy S3 and S4.